Lately I saw pictures of Tokyo Street on scoop.it SL Destinations several times and I read a bit more about it in some blogs. 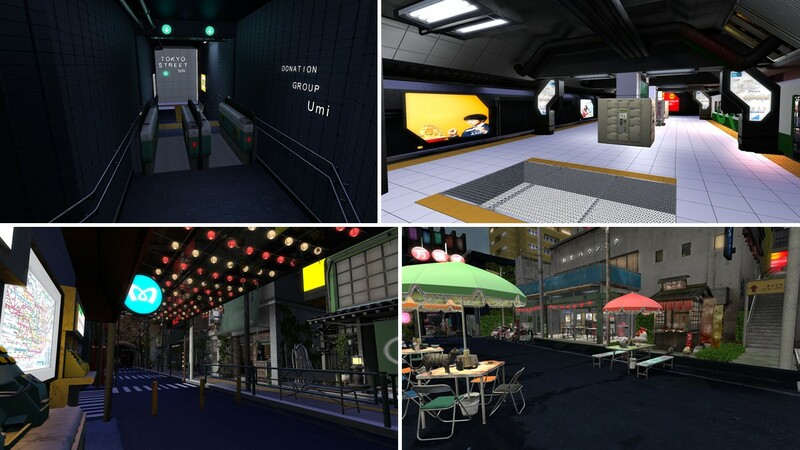 I learned that Tokyo Street is part of a (moderate) sim created by Paradox Ivory. It’s located on a seperate platform in 2.000m altitude. 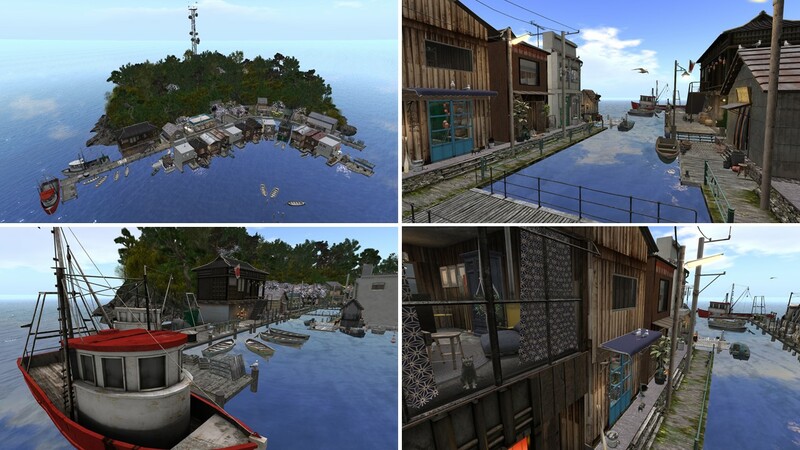 On the ground level of the same sim is a Japanese costal village named Umi. Paradox Ivory says about herself that she’s a dreamer, a prim addict and a sim designer. In her picks I found a comment about Hinansho, a Japanese sim that I visited last year (see Simploring 2018 (98) Hinansho): “I love this Sim, its one that has inspired me since I first visted“. I started my simploring at Tokyo Street using the teleport to Subway Entrance NW. It is an amazing place to visit. When you leave the subway station you enter a small street lit by lanterns, full of life, restaurants, shops and clubs. It really looks busy and it looks how I expect Japan to be (I never was there in RL). It is really packed full with details and ittook some time to load the textures but it was worth the time! Once I left this area, I entered what a large town with skyscrapers, some smaller buildings which seemed to be leftovers from a long time ago. The city has everything, a police station, a train station, parks, a fair, many shops and restaurants and another area with small streets with a second subway station Entrance NE. The city is really impressive and I took many pictures. I zoomed out to get an impressions of its size. It feel way bigger inside than it is actually. I love all the details. Many shops and buildings are furnishedand you can walk in and sit down. Tokyo Street is a further development of SSOC with a touch of Hinansho. Great! I continued my simploring tour visiting Umi. What a contrast! And yet it is still Japan. Umi is a fisher village. It has two rows of houses arranged in a half circle. While one row nestles up against a huge hill, the second row faces the see and every house as sea view and most a pier for small boats. Again I enjoyed the many details. The houses are small, they are all furnished and every square inch is used (just as I picture Japan to be). I explored almost every house, I just left out 4 houses that were marked as private residences. After visiting Tokyo Street I enjoyed the peacefulness of Umi. But there’s more. I dared to climb the hill, I enjoyed the view from the radio tower on the top ofthe hill and I disovered a nice fisherman hut at the other side of Umi. My short visit to Japan was impressive. Having these 2 places with it’s connecting and opposing elements combined in one sim is really outstanding. I recommend that you switch on your sounds to hear the noise of Tokyo Street and the peace of Umi. There’s so much to see, so many details to discover that time really flew by. Thank you Paradox Ivory for sharing your sim with the public. I really enjoyed my visit to Japan.